Buying gold bullion is now cheaper and easier than ever before. And it's still, by a long way the safest way to own gold. Learn how. Gold Bullion is valuable precious metal - namely gold or silver. It comes in two main forms :- Gold bullion bars, and Gold bullion coins. What makes it gold bullion is simply that its value derives entirely from its precious metal content. 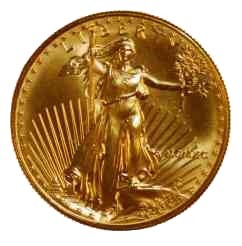 Unlike jewelry, or numismatic coins, gold bullion has no artistic component in its value. Some people do not understand why without that artistic component a relatively useless material like gold should have such a high value. To understand that you need to understand gold's monetary role. If you want to buy some gold bullion these days it is relatively easy to do so. Gold bullion coins trade quite close to the world gold price, but you will still pay a premium of perhaps 4% when you buy in quantity, and usually 8% when you buy smaller amounts. You should expect to suffer a similar 4-8% discount when you sell gold bullion coins back to the dealers too. Gold bars come in many sizes. Bought from private suppliers for private possession you will usually pay dealing costs similar to those for bullion coins. Gold bullion bars can weigh anything from a few grams upwards. 1kg and 100 oz (~3kg) bars are sometimes accepted by participants in professional bullion markets in Zurich and New York - though under strict controls to ensure bullion integrity. There is usually a premium on those locations, because London is the world's main physical bullion marketplace. In London the market deals in the London Good Delivery gold bullion bar. These gold bars are what most people think of as bullion. This London Good Delivery bar of bullion weighs 400 troy ounces - about 12.4 kilograms - and is about eleven inches long. It is stamped on the top (the bigger face) with the manufacturer's name, the weight, and the assayed purity. This bullion is commodity gold, and is handled as such in the vaults where the bars are stored. They don't have the idealized super-smooth finish you sometimes see in photographs of mock bullion. The bullion is so soft that the gold bars are frequently scratched on their faces, and flattened on their edges and corners. Also you can see the finish is slightly dented where the bars have been stacked up on top of one another. Neverthless, the London Good Delivery bar is the most important bullion product in the world. Loco London (meaning the physical bullion bars will be passed from seller to buyer in London) is the de-facto standard for bullion spot trading all around the world. 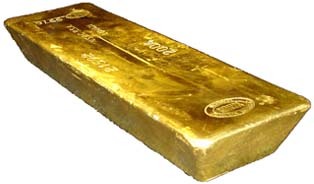 All bullion delivered against a London spot market trade (i) must be at least 99.5% pure, (ii) must come in bars of a standard shape weighing about 400 oz (iii) must have been accurately assayed so that he exact gold content of the bar is known (weight and purity are stamped on the bar) (iv) must have been manufactured by one of a listed group of refiners, and (iv) in almost all cases are only accepted from one of a very small number of accredited bullion vaults/couriers. London Good Delivery bullion is the cheapest form of gold to deal and own, and it fetches the best prices when it is sold. But bullion in this form is not very accessible to private buyers. The reasons are (i) that the bars - being so big - are expensive, and (ii) that the bullion vaults where they must be kept do not deal with the public. But fortunately if you do want to own bullion as an investment, you can now access professional market London good delivery bullion through BullionVault. If you are keen on buying some bullion gold you might like to continue your research by examining advantages and disadvantages of several different ways of buying gold. The word "bullion" itself certainly comes from French; though whether bouillon (boiling), bille (medieval ingot), or buillun (cauldron) is not entirely clear. These three are related to each other anyway.